Week III - It's all about the details! No job is finished until all the details are done. So many times I see remodels done where they didn't finish the details. Items like crown molding, hardware for cabinets, etc. can make or break any job. The contractor and I work very closely, communicating every day to make sure that we are both on the same page. Details like the crown molding roping matching the hardware. 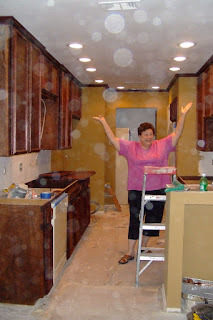 When using a decorator, your remodel can turn out so much better because nothing is left undone or forgotten. The crown molding is up and the stain is about to receive a satin finish on it. 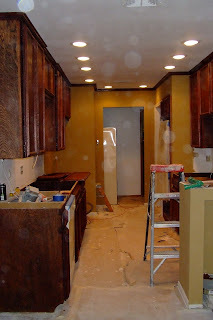 See how the wood crown molding makes the cabinets finished as well as making the color on the walls come alive. Keep posted over the next few weeks, all the details are going to come together.